We’ve consistently been impressed with the C7 Corvette program not only for the leaps and bounds improvements over its immediate predecessor, but also for its outstanding performance capabilities. For those in the market for a new C7 but feel the base Stingray isn’t special enough but the track-focused Z06 is just too much to handle, there’s the new 2017 Corvette Grand Sport. Chevrolet has just announced the car’s official pricing and, once again, it’s one hell of a bargain. For $66,445 (including destination), you can drive home in a new Grand Sport coupe, while the Grand Sport convertible will start from $70,445. Both are cheaper than, say, a comparatively equipped Porsche 911. You’ll get a downforce-producing aerodynamics package, enhanced cooling system, electronic limited-slip differential and Michelin Pilot Super Sport tires. 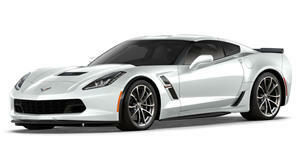 Chevrolet claims an estimated 1.05g in cornering capability, and up to 1.2g with the optional Z07 package. Opting for that package will also give you an estimated 0-60 mph time of 3.6 seconds and quarter-mile capability of 11.8 seconds at 118 mph (when paired up with the also optional paddle-shift eight-speed automatic transmission). Buyers will also receive unique front fender inserts, a Z06-style grille, wide fenders and rear quarter panels to accommodate a wider track. There’s also the optional Heritage package, featuring those Grand Sport-only has-mark fender graphics. The hash mark detail is also carried over onto the interior’s brushed aluminum trim. Later in 2016, a Grand Sport Collector Edition will be available. It’ll feature Watkins Glen Gray Metallic exterior with Tension Blue hash-mark graphics and several other unique touches inside and out. The 2017 Chevrolet Corvette Grand Sport will arrive in dealerships this summer.